Hunting season is coming up upon us, thus I am pretty sure many of you folks will be getting geared up and ready to tackle on that target! If you happen to be like the majority of hunters who prefer to hunt at night, needless to say you will be needing a reliable equipment especially a headlamp to be able to see where you’re going in the darkness. In which case,this article will help you pick out the right headlamp according to your specific needs. Enjoy reading! This is definitely one of those things that you cannot afford to turn a blind eye on. A headlamp is something that will be sitting at the front of your head for the whole duration of the hunt, thus if it is heavy and bulky it sure is going to cause strain and discomfort, leading to poor performance on your part. With that being said, you will want to go for a headlamp that is both lightweight and compact in size and an added plus, it will even make storing in your backpack even easier as it is not likely to take up much space leaving more for essential items. Upon purchasing an item, without a doubt you will expect it to last a long time. In this case, when we mention about durability, we will be focusing mainly on the waterproof feature on the headlamp although the make and the material of the headlamp should be taken into consideration as well. During certain seasons, the weather can be very unpredictable hence, it is very important to purchase a headlamp that is waterproof. Imagine if you are caught out in a rain storm and your headlamp gives out because it is not waterproof and you are left in pitch darkness. What a terrifying scenario! So to be on the safe side, make sure you get one that is waterproof for longevity. As I mentioned earlier, this is something that will be at the front of your head for a long period of time, thus you will want to ensure that the headlamp is as comfortable as possible and that the straps on the sides do not scratch or cause itches on the skin. Moreover, the headlamp must be easily operable as well because the less hassle the better surely. Often times products tend to come with loads of buttons and switches and leave the users in complete confusion which amounts to annoyance later on. It is important to keep in mind, that in the dark, you will want to on/dim the beam of the headlamp with a simple touch. Often times, hunt enthusiasts and experts tend to stay out all night and only return when the sun rises. Thus, you will want to get your hands on a headlamp that has a long period of battery time, ideally 25 hours and above. There are ones that come with a rechargeable function, but let’s be real here, you will be needing the headlamp throughout your hunt so there will not really be time to stop and charge your batteries. Unless you take a quick nap or break. Good quality headlamps often come with great battery time so make sure to purchase ones from reliable sources. Unlike the olden days, headlamps nowadays tend to come with multiple light functions namely white and red light and you will be able to adjust their brightness as well. What is the red light for you may ask? Well, it can be seen from great distances thus if you ever get lost,you will be able to rely on this light function to get help. Also, it is great for night vision ( better than white light even ).Alternatively, green, blue and yellow light under certain conditions are also great at preserving night vision and are less likely to startle the wildlife. 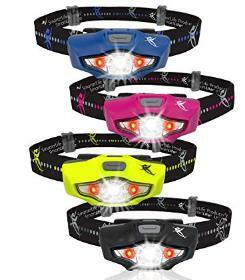 This headlamp is super lightweight, 3 oz therefore it is extremely comfortable and will not weigh your head down. In terms of durability, this is an IPX6 rated headlamp which means that it is more than capable of operating during heavy rainstorms and is waterproof to just a little under one meter depth ( it is not submersible however ). The headlamp itself is sturdy and well built so rest assured, it will last you for a long time.The Luxolite headlamp provides absolute convenience because it comes with 2 separate push buttons to select either the white or red light. Instantly set the exact brightness you want, and no cycling through the modes to turn it off will be necessary. The elastic headband is adjustable and comfortable to any size. Moreover, the head mount tilts down to focus light exactly where you need it, thus not only is it great for hunting, but for a myriad of other activities as well such as running, jogging, hiking, camping and biking. As for it’s battery time span, it can last up to 30 hours on the 3AAA Duracell batteries provided and it is rechargeable as well. It comes with two light options, white and red. There are 4 cool white modes (HI, MED, LO and SOS flashing) and 2 red night vision modes (steady and strobe). The red light is able to illuminate to a distance of 25 feet. Moving on to the disadvantages, the lamp is grounded, so if you leave batteries on for a month, the lamp will drain them so perhaps it will be better to remove them after use. The hinge on the battery closure compartment is quite susceptible to breakage so make sure to not drop the item onto hard surfaces. This headlamp is proven to be one of the lightest headlamps as it only stands at a weight of 2.6 oz. It is extremely compact, lightweight and non-bobbing( during hiking or running) as well, meaning that it’s use will be comfortable and hassle free. This headlamp is both water (IPX5) and shock resistant which is great as it is very durable and will stick around for a long period of time. This headlamp is made of high quality materials thus even after a few drops and smashes, it will be most likely working just fine. In terms of convenience, this headlamp is so easy to use that even kids can do so. This headlamp is able to tilt and swivel up and down and is ultra bright which is not surprising owing to its 160 lumens. It comes with 2 switches( one for each white and red settings ) and 5 settings: high beam, low beam, white strobe, red beam, and red flashing. 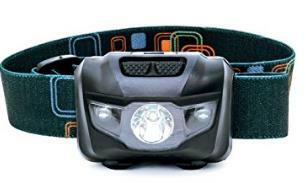 The non- slip strap prevents the headlamp from bobbing and causing discomfort. Also, this headlamp operates on 3 AAA Duracell batteries and has 12 hours of continuous light from the batteries before needing to be charged. The LED bulb can last up to 100,000 hours. As for light options, it comes in white and red light as mentioned above. Just like the previous product, the latch on the battery compartment is susceptible to breakage as well. Other than that, for it’s affordable price point, this is a great purchase. The Vitchelo headlamp is lightweight and not bulky at all which makes it great for long hunting trips. This is a more water resistant type of headlamp. It has a waterproof rating of IPX6 wherein it can only withstand splashing water or heavy downpours thus it is not suitable for underwater activities such as snorkelling. Convenience wise,it has 2 separate buttons for either the red LED or white light which makes choosing the right mode very convenient. A question most people seem to ask is do they need to cycle through the different functions to shut it off? In this case, no. Here’s why. If you push the button less than three seconds apart you will cycle through the modes. If you press the button after the unit has been in in a mode for more than three seconds it shuts off. Piece of cake right? It will please you to now that this headlamp has a long battery life. Each Vitchelo head-lamp has been tested, works great and includes 3 brand new AAA Duracell batteries that provide up to 120 hours of lighting! What more can one ask for really. There are two light options for this headlamp: white and red. Red light is easier for your eyes to adjust to, which means less strain and easier transition and is great for night vision and can be seen for a distance up to 110 meters. There are no major disadvantages to this product. This headlamp is the lightest of them all, weighing at a mere 1.5 oz. From the model itself, it is easy to tell that this headlamp is compact and small in size. In terms of durability, it is made out of durable and non-toxic materials which means that it is safe for kids to use. It has an IPX6 rating and is dustproof and shockproof as well. The SmarterLife headlamp has been tested with powerful water jets to ensure there is no leakage in battery or lamp compartments. This is one headlamp you will not have to worry about replacing soon. Despite having so many features, this headlamp is extremely easy to use, simply because the 6 built in light modes all can be accessed with the single touch of a button . Also,it is glove tested which means no more stopping to take off your glove to adjust your headlamp. Unlike the other headlamps, this one only runs on 1 AA Duracell battery. The battery life span depends on the intensity of the setting. For example, on the lowest setting, it will burn for just under 48 hours. On the middle level, about 15 hours. And on the very highest light output, the burn time is 10 hours. In terms of lighting mode options, there are 4 white (high, med, low, flash) & 2 red (steady, flash). Another great news is that these headlamps come in colours that can suit anyone’s taste: jet black, midnight blue, neon green and hot pink. Some of the disadvantages to this product includes that the headlamp does not function very well in cold weather and the high setting eats up the battery time even after short use. Although this headlamp is the heaviest among the rest, it is still considered to be lightweight and with it’s easily adjustable, retro looking elastic headband makes headlamp perfect for long distance runners or anyone else looking for a comfortable fit. It has a rating of IPX5, which means it is protected against splashing or spraying water from any angle. This headlamp is very durable as it is both cold(great for winter) and impact resistant. In terms of convenience, this headlamp is very easy to use and offers 165 lumens for ultimate brightness and a wide beam for proximity lighting, Moreover,it’s 45° tiltable body makes this headlight brightest and most versatile in its class. The headlamp comes with 3AAA Energizer batteries and the 3W technology MX20 provides more light with less power used, resulting in up to 45 hours of run-time.No more worrying about recharging the batteries in the midst of an exciting hunt.It comes with a low battery indicator as well. As for the light options, it comes with a variety of white and red light modes and the SOS and strobe mode is guaranteed to keep you safe in any situation.The only disadvantage to this item is that you will have to cycle through each mode over and over to shut it off. Well, I certainly hope this article has helped you in making a decision on which headlamp to purchase. No doubt there are plenty of others in the market, but we have narrowed it down to the top 5, and plus it is from a trustable and reliable source with great customer service. With that being said, happy hunting folks!